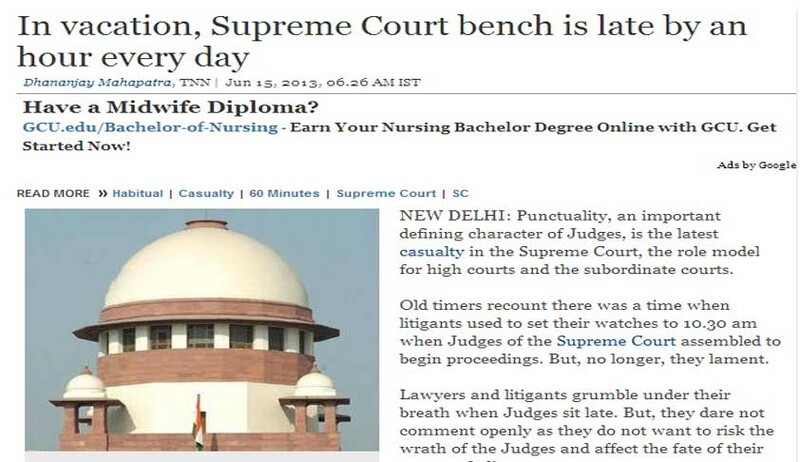 On 15th June, 2013 Times of India (TOI) published an article by Dhananjay Mahapatra titled, “In Vacation, SC Bench late by an hour”. The article had a shoulder headline: Justice G S Misra and CJI are habitual late comers. Justice Gyan Sudha Misra has written to the TOI about this article and she says TOI has indulged in irresponsible and contemptuous reporting. However Dhananjay Mahapatra still seems to stand by his story. I have been instructed to communicate to you that your newspaper and your Sr. Editor/Reporter Mr. Dhananjay Mahapatra have once again indulged in irresponsible and contemptuous reporting by getting the news story published in all the daily editions (15th June 2013) of the Times of India relating to Court timings of the Vacation Bench obviously to hog limelight denigrating the image of the Institution. Your report clearly reflects that small-minded people neither have the vision nor the understanding to appreciate a larger issue in the functioning of an Institution but have the audacity to publish mischievous reports as per their perception without disclosing full facts perhaps at the behest of a motivated lobby which needs to be investigated. Fortunately, wide and wiser section of the media do not follow your special trait. While writing irresponsibly on the subject in a derogatory style with enthusiasm, ignoring its negative impact on the judicial system, your newspaper and the Sr. Editor/Reporter Mr Dhananjay Mahapatra were expected to apprise themselves of full facts that while the Court during the vacation resorted to some flexibility in fixing its time schedule for taking up the matters, it also functioned beyond the Court hours to cater to the heavy Cause List mentioned at the last minute by the counsels to take up matters out of turn in view of their urgency, due to which it had to sit late in the evening daily atleast upto 7 p.m. in order to clear the orders for their dispatch as the orders were of urgent nature. Thereafter, the Judges also had to go through the next day's heavy paper books till late in the night and mornings for long hours. In the process, if the Court exercised some discretion by keeping the time schedule flexible during the vacation, without scarifying on the output, as judges also ultimately are human beings and cannot be expected to behave like robots, it was surely not expected to print irresponsible and misleading stories with half-baked facts It is high time to realize that while the time of lawyers and litigants are precious, the time of Judges also are not dirt cheap who go out of their way to tackle loads of matters and work for much longer hours besides what they devote beyond the working hours in Court and yet expect them to give an account of every single minute or else face derogatory publicity. You need to remind yourself that you have indulged in this exercise of irresponsible reporting for the second time targeting the Judge in particular as you had published an irresponsible and misleading story regarding the so-called 'daughters liability' in the year 2010 making a mockery of yourself and the newspaper in the estimation of the public at large but that has not deterred you from publishing another story which indicates your prejudice and penchant for cheap publicity. We have thus reasons to infer that you have been deliberately indulging in this exercise to intimidate the Judiciary in general and composure of the Judge in particular which is clearly contemptuous putting the judicial restraint to test. When you have the audacity to print a news story on any item creating a negative impact on the highest judicial institution, you are surely expected to have printed the entire facts relating to the story after checking the full facts as to how many hours the Court had been devoting to the matters as Vacation Judges reducing even the time of the lunch break to half an hour and very often skipping it over. Perhaps, you need to be reminded that a newspaper and the scribe cannot be allowed to exercise control or disciplinary jurisdiction over the functioning of an Institution in this manner howsoever discreet it may be, merely because you are able to denigrate the image by misusing the power of print or any other media violating all norms of ethics of journalism itself which is also equally expected to exercise restraint considering its influence on the mind-set which cannot be taken lightly. You and some of your interviewees would do well to remind themselves before sermonizing that the exterior form or upper crust of an institution is surely not the greatest virtue more so in the Judiciary as wisdom, substance, content and comfortable disposition of a judge is far more important than indulging in rigidity of any form while discharging judicial functions. You are expected to publish this response to your story forthwith in your newspaper as prominently as you published your story, failure of which will follow consequence." The story was based on facts and I stand by it.